many people still think all data in HANA which exists in the data area also loaded into memory all the time. Of course there are some techniques which influence the unload / placement of tables e.g. data aging and the non-active data concept of BW. Usually unloads happen based on a “least recently used” (LRU) approach, so the columns having not being used for the longest time are unloaded first. So HANA decides when it makes sense to unload some tables to free memory. But what about your own tables? Can you also take influence when data are unoaded? For general information you can refer to 2127458 – FAQ: SAP HANA Loads and Unloads. Ok you can manually unload or load tables. But you want to do this automatically and want to understand when tables are loaded or unloaded. Ok, may be you know the un-/load traces on the filesystem. But you don’t know why this happen. As you may be know the RowStore uses the shared memory of the linux system and with HANA it can’t be unloaded from memory. So the type RowStorePage has every time the disposition ‘Nonswappable’. Per default a CS table has the unload priority 5. The last access is 10 hours ago. The Page Cache has the unload priority short term and the last access is one hour ago. The column table has the lower result value (270 vs. 300) and so it is unloaded earlier than the pages of the page cache. The SAP standard tables shouldn’t be changed without any good reason. Thanks Jens for the detailed explanation. 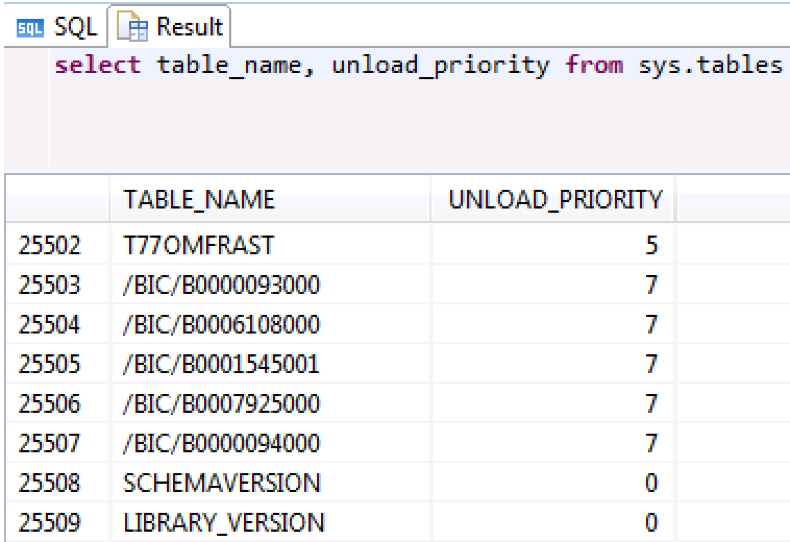 The un-load priority can also be checked from SE14 transaction under storage parameters option for tables. Thank you for this intro to table priorities. I am wondering how I can fully unload some “Full” “Loaded” tables on my Hana? The tables are just backup and I dont want to keep them in memory at all. All the tables have unload priority = 5 but when i do big queries, i always get memory allocation failures. I guess my question is say I Have a HANA 64 GB. My Column tables are loaded on 32 GB of memory. I want to do a join that requires 48 GB of memory. Will 16 GB of tables be unloaded automatically for this join to work? Do memory allocation errors or out-of-memory errors occur when joins are too complex? What causes these errors, and is the only solution to buy more memory? at first which HANA revision your are currently using? If this tables are backup tables which should not be loaded why you don’t set unload prio to 0? Have checked which heap areas are too big? Normally the working area should be big enough to meet your requirements, but what about the OOM dump which was created? So it depends on how your memory is used.